At least a few extra families started off their week with a trip to the Denton County Health Department Monday, getting their kids checked out "just in case" now that enterovirus-D68 has showed up in the county. On Friday, the county health department announced one child hospitalized for the illness that has affected at least 11 children in North Texas and about 443 people in 40 states across the country as of Monday. Denton County Health Director Dr. Matt Richardson said the good news is that the child in the Denton County case has been treated and released from the hospital, and so far no other cases or possible cases have been brought to his attention. However, we may only be seeing the start of the virus in the area, he said. Hospitals in North Texas have received an alert from the Centers for Disease Control about an investigation of nine cases of muscle weakness and paralysis in Colorado children, possibly attributed to enterovirus-D68. "It really feels like the cases, as more doctors, more physicians are testing for the virus, we're going to see more positives, I think, in the next few weeks," said Richardson. According to the Centers for Disease Control and Prevention, EV-D68 can range from a mild to severe respiratory illness that mainly affects children, infants and children. Health experts said it can be a tricky bug because it usually comes on looking like a normal common cold and then grows worse, developing into symptoms like a fever, wheezing and even trouble breathing. Richardson said the other challenge is that it's also an illness we're still learning about. In Colorado, most recently, doctors and the CDC began looking into about 10 cases of children coming down with a neurological illness causing weakness and even paralysis in the limbs. At this point they're still trying to determine how the enterovirus may have playing into that, if at all. "It's a 'time will tell' sort of thing. It's a very long road," said Dr. Joyce Oleszek, with Children's Hospital of Colorado. "It is still too early to know what the recovery will be for these children." 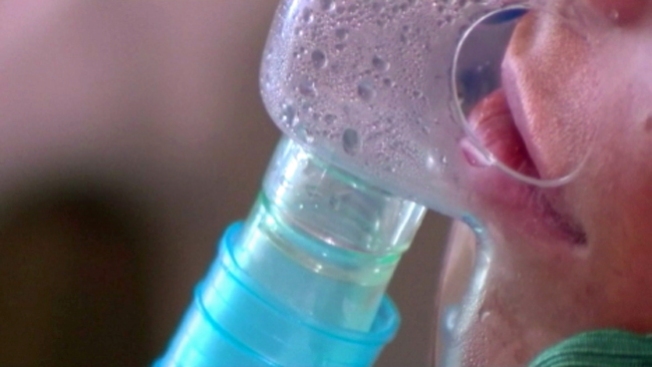 A growing health concern in North Texas, as Denton County Health Department confirmed the county's first pediatric case of enterovirus-D68 on Friday. The day before, Dallas County health officials confirmed 10 cases of the respiratory virus there. Doctors at Children's Health in Dallas are trying to determine how the virus is affecting children in North Texas. "In all likelihood, what we are seeing now, given the large spread of the virus, it's probably through a respiratory route," explained Dr. Jeff Kahn, who leads the infectious disease department at Children's Health. Kahn said the amount of children displaying symptoms of paralysis is small and appears to be rare. "In all likelihood, this virus has infected a very large percentage of children, and children who have neurological symptoms are really just the tip of the iceberg," he said. Health experts recommend folks follow the same prevention tips they do for the flu to avoid this virus. That includes hand washing, disinfecting surfaces, avoiding touching hands to your mouth or eyes and coughing into your arm.